Dr Paul J Wang is the Director of the Stanford Cardiac Arrhythmia Service and Cardiac Electrophysiology Laboratory. He received his undergraduate degree at Harvard University and his medical degree at Columbia University in New York City. He received his medical residency at Columbia-Presbyterian Medical Center in New York City and completed his cardiovascular training at Brigham and Women's Hospital. Dr Wang has co-authored textbooks on implantable defibrillators, sudden cardiac death, and cardiac resynchronization/biventricular pacing therapy and has invented a number of new arrhythmia technologies. He articipates on numerous national boards and panels in cardiac electrophysiology. He is currently Vice-Chair of the Education Committee of the Heart Rhythm Society. He is co-director of an Advanced Course in Pacemakers, Implantable Defibrillators, and Resynchronization Therapy sponsored by the Heart Rhythm Society. He also serves as a member of the Cardiac Electrophysiology Board Certification Exam Writing Committee of the American Board of Internal Medicine. Section I Advances in Antiarrhythmic Pharmacologic Therapy. Chapter 1 New Antiarrhythmic Pharmacologic Therapies and Regulatory Issues in Antiarrhythmic Drug Development. Chapter 2 New Frontiers in Antithrombotic Therapy for Atrial Fibrillation. Section II Future of Antiarrhythmic Therapy. Chapter 3 Principles of Pharmacogenomics: Focus on Arrhythmias. Chapter 4The Cardiac Sodium Channel Carboxy Terminus: Predicted and Detected Structure Provide a Novel Target for Antiarrhythmic Drug Development. Chapter 5Embryonic stem cell-derived cardiomyocytes as a model for arrhythmia. Chapter 6Gene and Cell Therapy for Sinus and AV Nodal Dysfunction. Chapter 7Gene Therapy for Cardiac Tachyarrhythmias. Section III Monitoring, Noninvasive Mapping, Risk Assessment, and External Defibrillation. 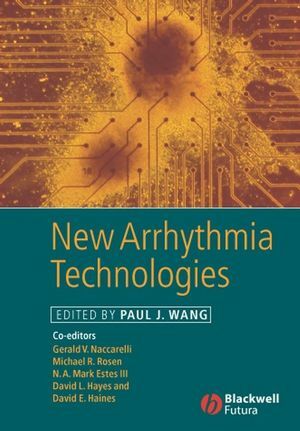 Chapter 8 New Developments in Noninvasive Rhythm Monitoring, Implantable Hemodynamic, Monitoring, Functional Status Monitoring ,and Non-Invasive Mapping. Chapter 9Techniques of Prediction of Arrhythmia Occurrence and Stratification for Sudden Cardiac Death. Chapter 10 Beta-blocker Efficacy in Long QT Syndrome Patients with Mutations in the Pore and Nonpore Regions of the hERG Potassium-channel Gene. Chapter 11 New Developments in Out-of-Hospital Cardiac Defibrillation. Section IV Advances in Pacing. Chapter 12 Sensor and Sensor Algorithms. Chapter 13New Electrode and Lead Designs for Pacemakers. Chapter 14Current Concepts in Intravascular Pacemaker and Defibrillator Lead Extraction. Chapter 15Left Ventricular Epicardial Lead Implantation: Anatomy, Techniques, and Tools. Chapter 16New Resynchronization Lead Systems and Devices. Chapter 17New Indications for Pacing. Section V Advances in Implantable Defibrillators. Chapter 18New Sensing and Discrimination Algorithms. Chapter 19Arrhythmia Prevention and Termination Algorithms. Chapter 20New Lead Designs and Lead-Less Systems. Chapter 21Optimization of Defibrillation Function. Chapter 22Remote Web-Based Device Monitoring. Section VI Advances in Catheter and Surgical Ablation. Chapter 24Advances in Surgical Ablation Devices for Atrial Fibrillation. Chapter 26Advances in Catheter Control Devices. Chapter 27Advances in Energy Sources in Catheter Ablation. Chapter 28New Ablation Paradigms: Anatomic Ablation of Complex Arrhythmia Substrates.